Go to original pattern for design DROPS 153-33. Knitted DROPS jacket with wave pattern in ”Bomull-Lin” or "Paris". Size: S - XXXL. Size: S - M - L - XL - XXL – XXXL. Bust: 100-100-120-120-140-140 cm / 39½"-39½"-47"-47"-55"-55"
Full length: 66-68-70-72-74-76 cm / 26''-26¾''-27½''-28 3/8''-29 1/8''-30'' - the garment will stretch approx. 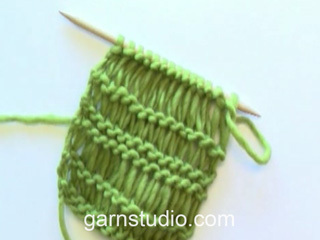 6-7 cm / 2½"-2 3/4" in length after wash.
DROPS CIRCULAR NEEDLE (60 or 80 cm / 24'' or 32'') SIZE 6 mm / US 10 - or size needed to get 15 sts x 19 rows in stockinette st = 4'' x 4'' (10 x 10 cm), or 14 sts wave pattern = width 10 cm / 4''. 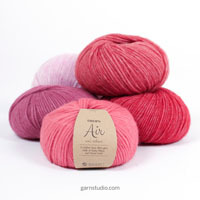 You can get the yarn to make this pattern from	41.25$. Read more. If you cast on new sts on 3rd row in pattern on right front piece, cast on new sts on 4th row in pattern on left front piece. If you cast on new sts on 7th row in pattern on right front piece, cast on new sts on 8th row in pattern on left front piece. If you finish on 3rd row in pattern on right front piece, last row on left front piece must also be 3rd row in pattern. 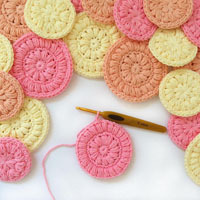 If you finish on 7th row in pattern on right front piece, last row on left front piece must also be 7th row in pattern. Bomull-Lin will be more even and look better after it has been washed. When the garment is finished, soak it, stretch it to correct measurements - see chart, and leave it to dry flat. The garment will stretch approx. 6-7 cm / 2½"-2 3/4" in length after wash. Worked back and forth on circular needle. Front and back piece is worked in one over shoulder. Cast on 57-57-65-65-73-73 sts on circular needle size 6 mm / US 10 with Bomull-Lin. Work 1 ridge in GARTER ST, see explanation above, AT THE SAME TIME on last row dec 7-7-8-8-9-9- sts evenly as follows: K 1, * K 2 tog, K 6 *, repeat from *-* 6-6-7-7-8-8 more times = 50-50-57-57-64-64 sts. S-M: A.1 (= 8 sts), A.2 3 times in total. L-XL: K 1, A.2 4 times in total. XXL-XXXL: A.1 (= 8 sts), A.2 4 times in total. Continue back and forth the same way until piece measures 42-44-46-42-44-46 cm / 16½"-17 1/4"-18"-16½"-17 1/4"-18". Then loosely cast on 28 new sts for sleeve at the end of next row from RS = 78-78-85-85-92-92 sts. 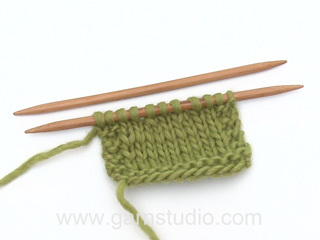 Adjust according to pattern so that the new sts are cast on at the end of 3rd or 7th row in pattern – READ KNITTING TIP 1! Then continue as before but work 2 extra repetitions of A.2 over the new sts on sleeve. Continue until piece measures approx. 66-68-70-72-74-76 cm / 26''-26¾''-27½''-28 3/8''-29 1/8''-30'', and adjust so that next row from RS is 3rd or 7th row in pattern – READ KNITTING TIP 2! On next row from RS work the first 27-27-28-28-29-29 sts before slipping them on a stitch holder. 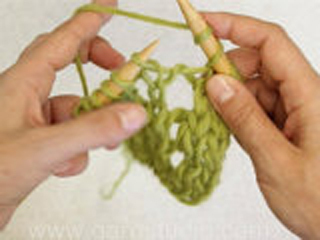 Slip the remaining 51-51-57-57-63-63 sts on another stitch holder without working them first. Cast on 58-58-65-65-74-74 sts on circular needle size 6 mm / US 10 with Bomull-Lin. Work 1 ridge in GARTER ST, see explanation above, AT THE SAME TIME on last row dec 7-7-8-8-9-9 sts evenly on last row in ridge as follows: K 2-2-1-1-2-2, * K 2 tog, K 6 *, repeat from *-* 6-6-7-7-8-8 more times = 51-51-57-57-65-65 sts. S-M: K 1, A.2 3 times in total, A.3 (= 8 sts). XXL-XXXL: K 1, A.2 4 times in total, A.3 (= 8 sts). Continue back and forth the same way until piece measures 42-44-46-42-44-46 cm / 16½"-17"-18"-16½"-17"-18". Then loosely cast on 28 new sts for sleeve at the end of next row from WS = 79-79-85-85-93-93 sts. Adjust according to right front piece and pattern so that the new sts are cast on at the end of 4th or 8th row in pattern – READ KNITTING TIP 1! S-M: K 1, A.2 until 8 sts remain, A.3 (= 8 sts). 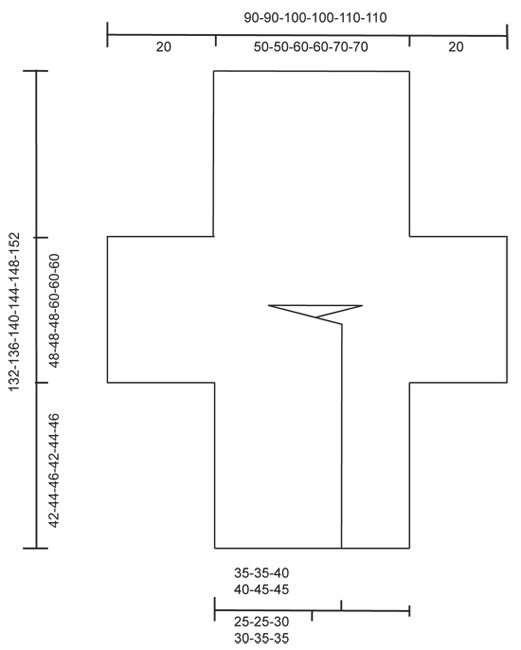 L-XL: K 1, A.2 over the remaining sts on needle. XXL-XXXL: K 1, A.2 until 8 sts remain, A.3 (= 8 sts). Continue to work until piece measures approx. 66-68-70-72-74-76 cm / 26''-26¾''-27½''-28 3/8''-29 1/8''-30''. 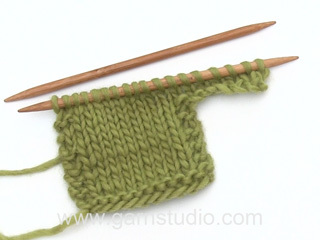 Adjust according to right front piece and make sure that next row from RS is 3rd or 7th row in pattern – READ KNITTING TIP 2! On next row from RS work the first 51-51-57-57-63-63 sts as before, slip the remaining 28-28-28-28-30-30 sts on a stitch holder. Then cast on 25-25-27-27-29-29 new sts at the end of row (= back of neck), work sts from right front piece = 127-127-141-141-155-155 sts. INSERT A MARKER HERE. NOW MEASURE THE PIECE FROM HERE. Continue pattern from front pieces over all sts as follows from RS: K 1, A.2 9-9-10-10-11-11 times in total. When piece measures 24-24-24-30-30-30 cm / 9½"-9½"-9½"-11 3/4"-11 3/4"-11 3/4" from marker mid on top of shoulder, bind off 28 sts at beg of the next 2 rows for sleeves (adjust to bind off on 3rd and 4th row or 7th and 8th row) = 71-71-85-85-99-99 sts. Continue with pattern until piece measures approx. 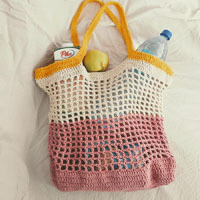 65-67-69-71-73-75 cm – adjust according to front piece to finish after 3rd or 7th row in pattern. Then work 1 ridge AT THE SAME TIME on 1st row in ridge inc 14 sts evenly as follows: K 1, * K 2 in one st, K 4-4-5-5-6-6 *, repeat from *-* 13 more times = 85-85-99-99-113-113 sts. Piece measures approx. 66-68-70-72-74-76 cm / 26''-26¾''-27½''-28 3/8''-29 1/8''-30''. Loosely bind off. Work sts from right front piece, pick up 25-25-27-27-29-29 sts in the back of neck and work sts from left front piece = 80-80-83-83-88-88 sts. Work 3 ridges AT THE SAME TIME on 1st row in ridge inc 10 sts evenly as follows: K 0-0-3-3-8-8, * K 2 in one st, K 7 *, repeat from *-* 9 more times = 90-90-93-93-98-98 sts. Loosely bind off. Fold the piece at the shoulder. Sew sleeve and side seams in one. Sew in outer loops of edge sts to avoid a chunky seam. When the garment is finished and assembled, soak it, stretch it to correct measurements - see chart, and leave it to dry flat. Läcker! Kul att slippa sy axel- och ärmsömmar. Sömmarna kan virkas med baklänges fasta maskor (löst här eftersom arbetet töjer sig) som ser ut som en snodd. Har inte stickat plagget, så jag vet inte hur det skulle se ut … Det brukar bli fint också längs kanter. Ang. jakken: Love at first sight. Lurer på hva tegnet med en firkant inni enn firkant betyr? står ikke i tegnforklaringen. Hei Elisabeth. Jo, det er tegn nummer 4: 3 kast om p, 1 rett. God fornöjelse. Bellissimo capo, estremamente versatile, adatto per tutte le occasioni! Magnifico sia con un jeans che con un elegante tubino nero. Oh so nice. I hope it makes it to the website. Classic! Meraviglioso. Incantevole per le sere d'estate. Can't wait to see this pattern! Looks great!